Anamorphine is a surreal game. It doesn’t have any controls other than the analog stick for moving, and another one for looking around. Interaction is handled by approaching objects and looking in certain directions, with each and every interaction shifting the entire world around you, not just in small ways, but your entire perception of things. It’s a journey into mental illness and meant to communicate what many perceive as an extremely sensitive subject matter through a beautiful and memorable art form. Anamorphine is a journey through the mind that will cause you take a journey through your own. In one part of the demo, I was in a massive empty theater. I walked upstairs to the balcony seating, and as I passed a pillar, the stage became lit up and a girl sat playing a cello in the center of it. I gazed down at her for a few moments wondering what to do next. When I turned around, I was shocked to see that the seats were now filled with shadowy figures. Anamorphine is not a horror game exactly, but it does use some of the same tactics that horror games employ to get under your skin a little bit. It’s meant to make you feel uncomfortable. It’s meant to make you think. That’s what these jarring moments can do. Things like that empty theater suddenly being full really stuck with me long after I had left the demo booth. The familiar melts away, revealing the strange and surreal. It happens before your eyes, and yet you barely notice it fading until it’s almost gone. As I descended the stairs and approached the stage, I found that I couldn’t move forward any further. Again, wondering what to do, I tried to back up only to find out that my field of view had become a picture on a wall. I was no longer in the theater. I was in a small room. It’s these kind of jarring transitions that force your mind to reconcile with the fact that you aren’t where you were, and that soon, you might not be where you are. Anamorphine will make you question your knowledge up, down, left, right, and everything in between. It challenges your mind in ways that no other game does. I wasn’t able to play in VR at PSX due to a problem that the developers ran into just before the show, but I can only imagine how surreal the entire experience would have been with the immersion and depth of being present. I can’t wait to see how something like the stage at the theater becoming a picture are handled in the headset, and excited to see how it messes with my perception of reality and emotions. The whole experience is psychologically unnerving, yet altogether beautiful. A static image cannot convey the eerie feeling of turning around in an empty theater, only to find every seat filled. 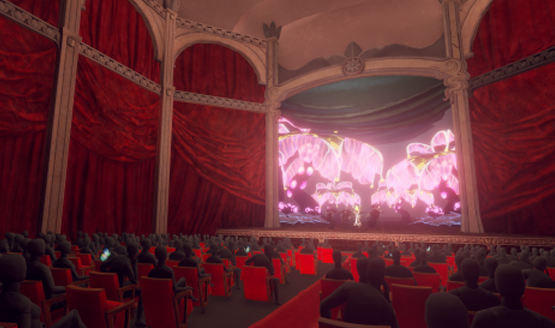 When Anamorphine was announced for PS4 and PSVR, the developers talked about how dark and emotional the game will get. It’s not a horror game in terms of jump scares, but there will certainly be elements of a dark and mentally isolating horror, which is sometimes scarier than any monster, creature, or jump scare could be. Anamorphine is the journey that we all take in our minds in those darkest of moments, and from my brief demo, it looks to bring that surreal mess of cognitive emotion to an audio and visual apex. As much as I’m excited to explore the story of the couple in Anamorphine, I’m more excited, nervous, anxious, and scared for how Anamorphine will help my explore the depths of myself. Anamorphine will be releasing on January 16 in 2018 and will be compatible with both PS4 and PSVR.